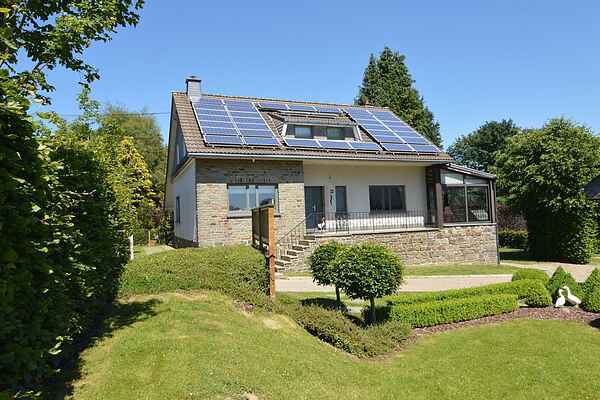 This pleasant holiday home is located on the outskirts of the very quiet little village of Elsenborn. It's the perfect place to go as a family or with friends! Numerous sporting and cultural activities await you in the Hautes Fagnes (in Belgium) or in the Eifel park (in Germany), or you can simply go for walks in the nearby woods. After your days outdoors, you can come back and relax in a welcoming house. There's even a complete space on the ground floor dedicated to well-being and games with a sauna, and a pool table and table football room! Outside, flowerbeds brighten up the house throughout the seasons. A small garden opposite the kitchen enjoys a very pleasant view. Children will want to spend hours there, in the snow or playing in the playground built for them. Don't miss the opportunity of visiting Reinhardstein Chateau or the towns of Malmedy, Stavelot and Spa. The beautiful town of Montjoie in Germany is only a short distance away (20 minutes by car) and the Spa-Francorchamps track is approximately 30 km away.